The French Safer Internet Centre (SIC) exists to promote safer and better use of the internet and mobile technologies among children and young people. The national programme to raise the awareness of young people to the stakes of the internet: Internet Sans Crainte operated by Tralalere. The national toll-free number for the protection of young people on the internet (helpline): Net Ecoute 0800 200 000, operated by the association e-Enfance. The national service for the online reporting of illegal content (hotline) and partner of the INHOPE network: Point de Contact. Internet Sans Crainte is the national awareness-raising programme promoting a better internet for children and young people in France. Operating since 2007 by Tralalere, producer of pluri media educational programmes and awareness campaigns, it produces multimedia educational resources, often with the support of the Ministry of Education, which are extremely widely used both in schools and in other educational structures. Relying on an active, participative approach, we aim at raising awareness among children, parents and educators for a better use of the internet, and promote safer and more creative online practices. In line with the Better Internet for Children Strategy of the EC, we produce resources in order to further enhance positive/critical/creative online practices by youth aged 9-18. Net Ecoute, 0800 200 000, is the French helpline: a national number for the protection of minors on the internet against cyber-harassment at school, provided with the support of the Ministry of Education. It provides help and advice to children and teenagers facing difficulties in their digital use, their parents, and professionals. The team is made up of psychologists, lawyers and specialists in new information technologies, which work with the authorities and industrialists of the digital technology. Created in 2008, Net Ecoute is a free, anonymous and confidential service. It is accessible Monday to Friday from 9:00 to 19:00 by phone, chat (www.netecoute.fr) and Messenger. Net Ecoute is a service operated by e-Enfance, a state-approved NGO and founder member of the governmental platform of victim assistance (www.cybermalveillance.gouv.fr). The French hotline, Point de Contact, was founded in 1998 as a self-regulatory instrument for the internet industry, in order to allow users to easily report potentially illegal content encountered online. Point de Contact provides a simple, anonymous and mobile-friendly web form at www.pointdecontact.net. The main scopes of activity of the hotline are child sexual abuse material (CSAM), racism and xenophobia, terrorism, and shocking content accessible to minors. It is always possible to report content anonymously, but if a reporter wishes to be informed of the outcome of their report, they may provide an email address. Point de Contact's mission is to assess those reports against French law and to deliver speedy notices of manifestly illegal content to law enforcement and internet services providers (ISPs). Point de Contact is also a founding member of INHOPE, the International Association of Internet Hotlines, established with the aim of fighting against child sexual abuse content worldwide. Giving children the chance to be actors of their digital lives begins with giving them the space to work together. To do that, we hold workshops in schools on topical subjects such as fake news, cyberbullying, child protection and e-citizenship. These kind of workshops allow children to use their digital knowledge and become familiar with the issues. Participation allows children to develop their digital skills: one of the most important skills of the 21 century. Through a peer-to-peer approach, young people are able to support other children. The French Safer Internet Centre (SIC), made up of three stakeholders: Internet Sans Crainte (Awareness Centre), Point de Contact (Hotline) and e-Enfance (Helpline), aims to educate children, their parents and educators about safer and more responsible use of the internet, and to fight against illegal content online. The Safer Internet Centre participates also in the promotion of positive uses of digital technologies, hence its participation in the Better Internet for Kids (BIK) project for the benefit of children. Its role is also to develop the knowledge and necessary know-how for young people so that they develop digital and creative uses of technology, and become actors in their own digital life. Implementing actions around critical education and information. collecting and reporting illegal content. answering questions from young people and their families. Institutions: Agence du numérique, CNIL, Comité Interministériel de Prévention de la Délinquance et de la Radicalisation (CIPDR), Délégation Interministérielle à la Lutte Contre le Racisme, l'Antisémitisme et la Haine (DILCRAH), Ministère de l'Education Nationale, Ministère de la Culture, Ministère de l'Intérieur, Ministère de l'Enseignement Supérieur et de la Recherche, PEEP. Industry: Cluster EdTech, Facebook, Google, Microsoft, Orange, S.E.L.L., Snapchat, Twitter. 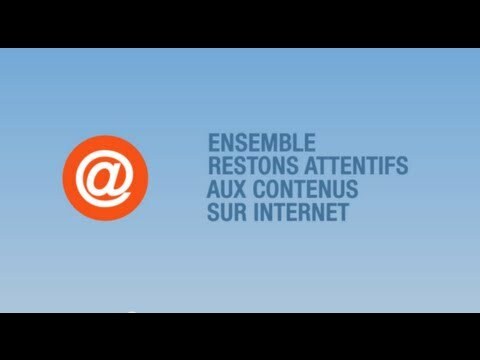 Associations: AFEV, BSF, Class'Code, FCPE, FFtélécoms, La ligue de l'enseignement, MAE solidarité, Renaissance numérique, UNAF. Academics: Université Paris VIII, Institut National de Recherche en Informatique Appliquée (INRIA). Parents, let's talk about it! Rights and duties online : what does the law say ?